Grafik Warfare is an up and coming street art collective based in Brighton, across the UK and beyond. Working in a variety of media they set out to depict or augment urban landscapes in a raw and unpretentious style. 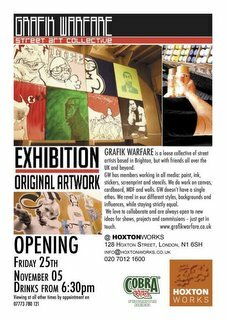 The upcoming show at Hoxton Works exhibits nearly forty canvases by members of the collective, alongside previously unseen works.